Two University of Rochester faculty members—biologist Nancy Chen and chemist Ellen Matson—are among this year’s recipients of prestigious Sloan Research Fellowships. Matson, an assistant professor of chemistry, has also been chosen as a Cottrell Scholar by the Research Corporation for Science Advancement. The honor recognizes “the very best early career teacher/scholars in chemistry, physics, and astronomy” for both innovative research and teaching. As an evolutionary biologist, Chen analyzes how different evolutionary forces contribute to genetic variations. One of her current projects involves working with a population of endangered, wild birds—Florida scrub jays—that has been individually marked and studied since 1969. “It’s really important to me to study organisms in their natural environment because selection pressures will be different in the lab versus in the field,” Chen says. 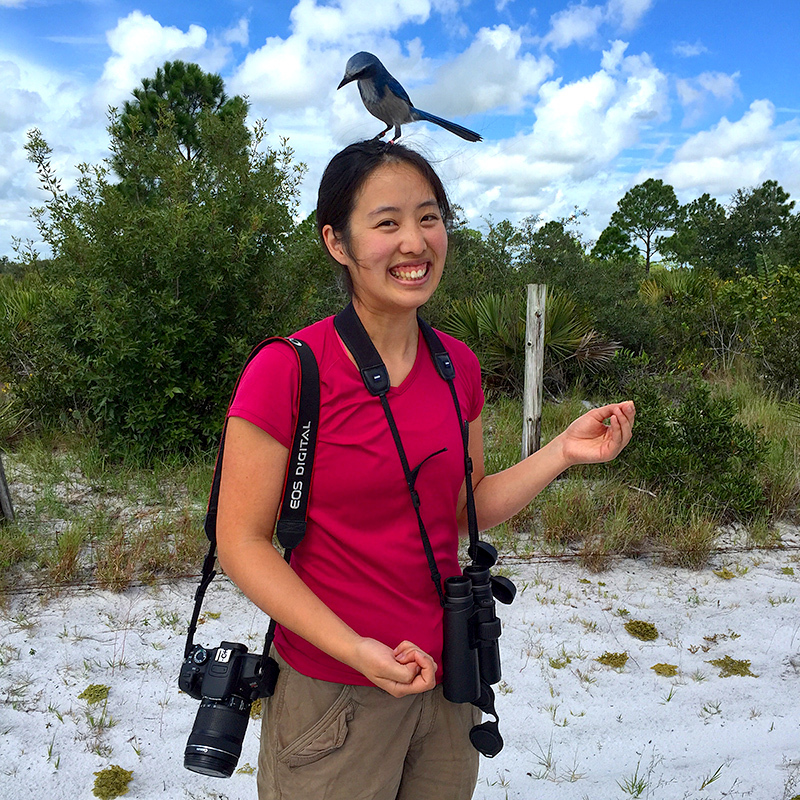 Using 50 years of data, Chen pioneered the genomic analysis for the wild Florida scrub jay population and is now tracing evolutionary patterns through many generations of the species. While the Department of Biology is strong in research on evolutionary genetics, currently that research is done almost entirely in invertebrates, Welte says. “Nancy complements this strength by bringing a vertebrate model system to this area of research, and one that has high ecological relevance.” Besides providing unprecedented insights into deep evolutionary questions, Chen’s work is important for conservation biology and for understanding the development of drug and pesticide resistance. “Nancy is a rising star at the intersection of multiple fields—evolution, genomics, and ecology—and the recent award of a Sloan Research Fellowship underscores that the broader scientific community recognizes her great potential,” Welte says. Chen joined the University faculty in 2018 after serving as a National Science Foundation postdoctoral researcher at the University of California, Davis, and a postdoctoral research associate at the Cornell Lab of Ornithology. She received her PhD in ecology and evolutionary biology from Cornell in 2014 and received her undergraduate degree in biochemical sciences from Harvard. In addition to her research, Chen is dedicated to increasing diversity and inclusion in STEM. Since joining the University, she co-founded a Women in Biological Sciences (WIBS) group that meets monthly to discuss a range of topics surrounding women in science, including mentoring, inclusive lab environments, and work-life balance. She is also involved in creating diversity and inclusion programming for the American Ornithological Society, and, in 2017, was awarded the American Ornithological Society’s James G. Cooper Young Professional Award. Matson’s lab studies the reactions that occur between molecules called ligands, and the small, molecular-sized clusters of metal atoms they attach themselves to. 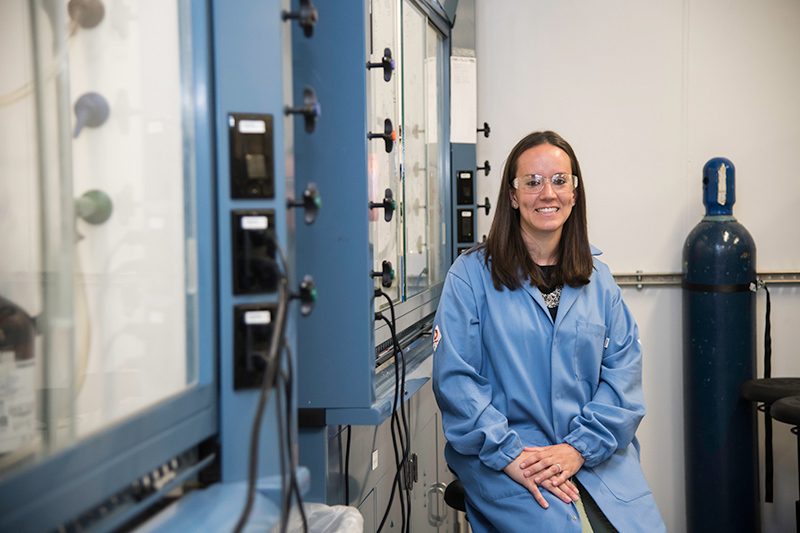 Her work is focused on developing catalysts for the conversion of inert gases and contaminants into energy-rich fuels and useful chemical products. For example, her lab recently reported creating, for the first time, an oxygen-atom vacancy on the surface of a metal oxide. This technique could eliminate much of the guesswork in designing more effective catalysts for converting greenhouse gases to useful chemical fuels. Working with collaborators at the University of Buffalo, her lab has also modified a metal oxide cluster so that it would be nearly twice as effective in storing energy in backup systems for large grids that rely on solar and wind power. Both of these research areas represent topics “at the forefront of energy science and demonstrate that Ellen is an emerging leader in this field,” says Todd Krauss, professor and chair of the Department of Chemistry. “This creative use of self-assembled, mixed-metal cluster complexes puts her in a unique position to change the landscape of energy-related chemistry. Matson joined the University in 2015 after serving as a postdoctoral researcher at the University of Illinois-Urbana Champaign. She received her PhD from Purdue in 2013. As an undergraduate she received degrees in both chemistry and science education at Boston University and is licensed to teach high school science. Since joining the University, she has participated in initiatives to promote improved teaching, including new training for graduate teaching assistants to better prepare them for leading workshops and labs within the department. She also has collaborated with the Rochester Center for Community Leadership and the Center of Excellence in Teaching and Learning to develop two new undergraduate courses. Both “take innovative approaches to developing unique learning experiences for STEM majors,” Krauss notes. Matson’s previous awards include a National Science Foundation CAREER award; the Edith Flanigen award from Humboldt University of Berlin, which recognizes emerging international talent in metal-oxide research; the Course Hero-Woodrow Wilson Fellowship for Excellence in Teaching; and a University Furth Fund award, given to foster the development of promising scientists in the natural and biological sciences.